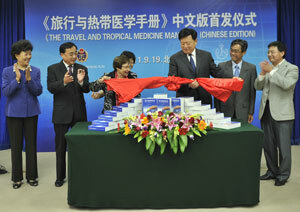 Earlier this month, IAMAT’s President M. Assunta Uffer-Marcolongo was invited to Beijing for the launch of the Chinese edition of The Travel and Tropical Medicine Manual, 4th Edition edited by two key IAMAT supporters, Dr. Elaine Jong and Dr. Christopher Sanford. The translation of this textbook is a significant milestone for travel medicine in China. As one of the most popular travel destinations, Chinese travel health providers see thousands of international travellers every year, including Chinese travellers going abroad and returning expatriates. This learning tool (now available in their own language) helps practitioners to further implement internationally recognized travel medicine best practices. It also fosters opportunities for the advancement of travel medicine’s knowledge base, training, practice, and research benefitting all travellers.The launch, which took place on September 19, was attended by doctors from local IAMAT affiliated clinics. From left to right: Chen Xiao Feng, Ge Zhirong, M. Assunta Uffer-Marcolongo, Wei Chuan Zhong, Victor Lam, and Wang Feng Ting. Also present were Wei Chuan Zhong, AQSIQ Vice Minister; Chen Xiao Feng, AQSIQ Director of Health Quarantine; Ge Zhirong, CIQA President; Victor Lam, Chief Representative of Elsevier publishing in China; Wang Feng Ting, Vice Director of Beijing University Medical Press; Dr. Liu Zy and his colleagues at CITHA; Dr. Zhang Min, the translation co-ordinator; as well as staff from the AQSIQ Health Quarantine and International Cooperation Departments. *See below for a list of the organization abbreviations. The new Chinese translation of The Travel and Tropical Medicine Manual, Edition 4 (TTMM4), is dedicated to Mrs. Assunta Marcolongo, President of the International Association for Medical Assistance to Travellers (IAMAT), with headquarters in Guelph, Canada. Over the past two decades, Mrs. Marcolongo has worked with Chinese colleagues to develop educational programs and educational exchanges in order to increase knowledge and awareness of travel medicine in China among physicians and other health care workers. Possessing a deep interest in Chinese history and culture, she has traveled extensively in China since 1995 to conduct training sessions on the curriculum of international travel medicine, and to inspect Chinese travel medicine clinics wishing to join the IAMAT global network of English-speaking doctors committed to providing high quality medical services to travelers. Mrs. Marcolongo has been an inspiring advocate for quality improvement, and has become a treasured friend to many of the Chinese colleagues she has worked with. It is due to the encouragement and vision of Mrs. Marcolongo that the project to publish an official translation of the TTMM4 has been accomplished. Dr. Elaine Jong, the senior editor of the TTMM4, met the late Dr. Vincenzo Marcolongo in the 1980’s and discovered that they shared a passionate interest in the health of international travellers. Dr. Marcolongo read the first edition of the TTMM published in 1987, and gave Dr. Jong valuable comments on its content. Dr. Marcolongo was the founder of IAMAT in 1960, a non-profit organization dedicated to providing up-to-date health information directly to international travellers, to coordinating a global network of English-speaking doctors who agreed to provide excellent care to travellers, and to developing education programs on travel medicine for health care professionals. Dr. Marcolongo invited Dr. Jong to join IAMAT’s Medical Advisory Board. Following Dr. Marcolongo’s premature death in 1988, Assunta Marcolongo became President of IAMAT, and Dr. Jong became Chairman of the IAMAT Medical Advisory Board, and they have collaborated in many ways to fulfill the educational mission of IAMAT since that time. Dr. Marcolongo had believed that it was important for physicians caring for international travellers to become familiar with the clinical practices and medications used in the traveller’s country of origin. For some physicians working in countries serving as popular travel destinations for Western travellers, this meant that some of their medical training should take place in an English-speaking educational environment. In 1995, Mrs. Marcolongo and Dr. Jong began to work with Chinese colleagues to promote travel medicine education in China, and beginning in 2002, IAMAT developed a pilot program for short-term clinical travel medicine education of Chinese medical scholars at the University of Washington, Seattle, USA, where Dr. Jong was on the medical faculty. Just a decade later, IAMAT is proud that a growing number of Chinese travel medicine physicians have taken the International Society of Travel Medicine (ISTM) Certificate of Knowledge Examination and have been awarded the Certificate in Travel Health (CTH), recognized as a standard of excellence throughout the world.